This remake may be the first example of colorization of a previously-made film. However, unlike Ted Turner, the Lumière Brothers did not take a “classic” black & white movie and add color, they re-shot the whole thing and added color! Try doing that with the opening sequence to the “Wizard of Oz,” Ted! As in the original “Card Party” we see a group of three men sitting around a table, playing cards. One of them is wearing a green cap or beret and the other has a green vest. A woman in a colorful dress sits behind them, apparently kibitzing, and she is the one served wine by the maid. 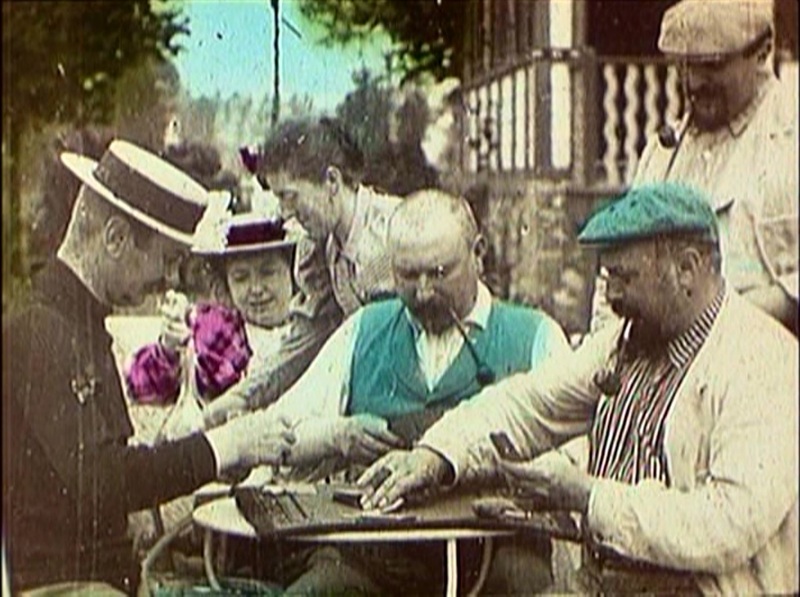 As the men continue their playing, she pours out several glasses of wine for them, and the one nearest her is distracted from the game to take the glass of wine. Another man stands in the background, watching the game and also passing out the glasses once the woman has finished pouring. When I watch this, I find that my attention is on the woman for most of the movie. It could be her pink checked dress that distracts me, but I find her actions more visually interesting than those of the men, engrossed as they are in a game that I don’t know and can’t follow. The question of “what will happen with the wine” is more compelling to me than “who’s winning the game.” The colors are somewhat subdued, suggesting either deterioration or a two-color process. The colors are also limited only to certain garments, no attempt was made to hand-color the entire scene. I have compared this to the original, but I’ve been unable to identify any of the actors as being the same men, so I’m not sure who’s in this, but the Lumières often used neighbors and family members for their movies.